The philosophy and financial capability of the partners often determine the capitalization methods a firm uses. It is common to see firms use a combination of approaches. For example, a firm might create a base capital layer by requiring owners (partners/shareholders/members) to contribute an amount of capital (cash) commensurate with their ownership interest. Capital needs beyond the base layer are addressed using earnings holdbacks and/or debt. Paid in capital is almost always made with cash. In some situations, owners may contribute real property (furniture and equipment) or Accounts Receivable or Work in Progress from their former firm. The amount if paid in capital typically depends on the size of the firm, billing and collection cycles, owners’ draw policy, and the maturity of the firm. For example, a startup firm will need more capital than an established firm. The financial ability of the partners is also pertinent to how much permanent capital a firm can maintain. Older partners can typically contribute more to a firm because they have had more time to accumulate wealth. New partners may generate profit for the firm and command a high ownership interest but have not yet had time to accumulate wealth. Some firms are willing to internally finance an owner buy-in over a period of years (withholding future distributions or making a note). Other firms arrange to finance a buy-in through the firm’s bank, and some require owners to make their own provisions for paid in capital contributions. Paid in capital is not always a material part of the capital structure of a law firm. New and younger firms often use debt (line of credit) to provide capital to the firm. In these instances, the owners personally guarantee the note and pledge the firm's billing assets (accounts receivable and work in progress). We recommend that firms require a level of paid-in capital equal to at least two months of operating expenses. For example, a firm that has a monthly expense and owners' draw outlay of $100K would require the owners to collectively contribute $200K to the capital of the firm. New and young firms may initially have difficulty with this level of permanent capital, and it may take 3 to 5 years to reach this point. Undistributed earnings usually relate to current year monies earned by the owners but not distributed. Earnings that are undistributed typically remain in the firm general operating account and act as a source of working capital. Withheld earnings result from a more structured approach. For example, a firm may decide to hold back from distribution a percentage of current year earnings. Depending upon the hold back formula, withheld earnings provide a layer of working capital less stable than permanent capital (paid in capital). For example, a firm that holds back 30% of earnings to finance the operations of the firm will have more or less capital depending on the net income of the firm. In times when the firm is doing poorly, capital resources will deplete and cause a need for increased borrowings. This is the wrong approach. Alternatively, when the firm is doing well the withheld capital may exceed what is necessary. As most law firms are taxed as partnerships, undistributed current year earnings are taxable to the owners. If the capital holdback is excessive, the owners may struggle to make estimated tax payments. Creating unnecessary financial pressure for the owners is not recommended. Properly capitalized firms can pay partners timely. We recommend completing the payment of all prior year earnings to the owners no later than April 15 of the following year. This allows owners to receive the cash in correspondence with their allocated income, enabling them to pay taxes on time. Debt is a borrowed source of capital. Law firms who use debt generally have a line of credit used to fund current operating expenses between collections of accounts receivable. Lines of credit are typically reduced when accounts receivable are paid. Most law firms advance money on behalf of their clients. Until the client is billed and pays the firm back, there is a negative impact on the firm’s cash balance. 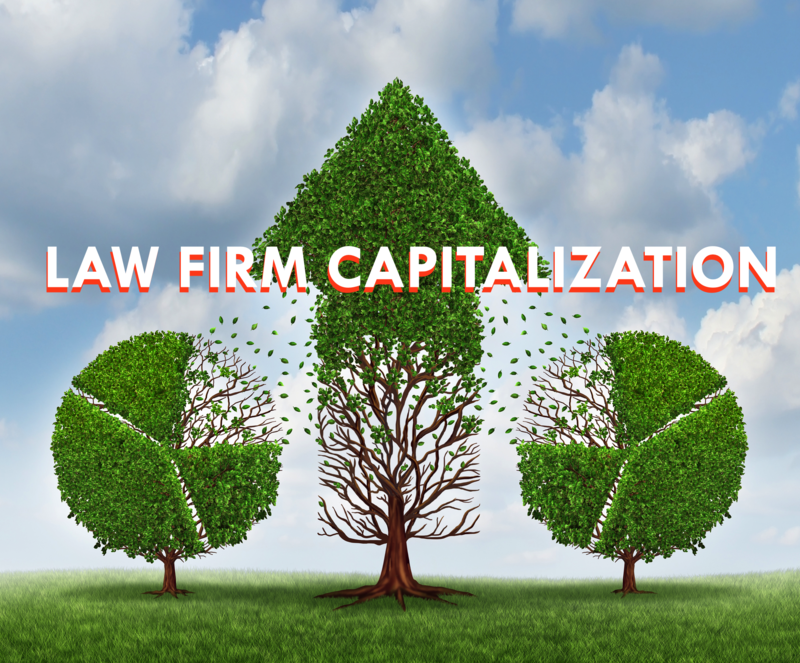 Depending on practice type, a firm will always need capital to fund client advances. Plaintiff firms who operate on a contingent basis have the most difficulty funding client advances. Outstanding client costs and delays in client payments contribute to the need for lines of credit. Other uses of capital include leasehold improvements, furniture and equipment, computers, and other depreciable assets. Unlike payroll and office expenses which are immediately deductible, assets are typically expensed (reductions in owner income) over a longer time period. When this occurs, it causes a timing difference between when monies are spent and when partner income is reduced. For example, if a firm invests money to buy new computers it is unlikely that they will expense the entire amount in one year. If the partners decide to expense the assets over the useful life of the equipment, only the amount written off in the current year will reduce partner income. When this happens, owner income is greater the amount of cash available for distribution. To deal with this situation, a firm will often secure a bank note with a fixed principal repayment amount and interest rate. A rule of thumb is to pay back the long term note at the same rate that assets depreciated (expensed) each year. In this way, cash flows for debt repayment correspond with the depreciation expense. This approach seeks to eliminate the cash strain that occurs from expending large sums of money on assets that are expensed in subsequent years. Too often, law firms will have a mixture of short term debt (lines of credit) and undistributed earnings. We recommend a firm adopt a capital policy that balances permanent capital, withheld earnings, undistributed earnings, and short and long term debt. Other sources of capital include payment terms extended by vendors (trade credit). While we don’t recommend stringing vendors out beyond terms, there is some advantage to taking the conventional 30 days to pay. Additionally, some vendors who provide services to a law firm’s clients are willing to wait for payment until the firm is paid by the client. These instances are less common but do exist. Equipment leases, installment agreement, and most other forms of capital are debt instruments. Mature firms who have the discipline to implement a capitalization policy are better able to manage debt, take more strategic risks and enjoy more financial stability.